Guardians of the Galaxy is going to be the first movie in the Cosmic arena of the Marvel Universe and there are a ton of things to look out for. It will introduce a ton of characters and races to the Marvel Cinematic Universe. Watch for these Easter Eggs! The Legendary Hidden Easter Egg! James Gunn has mentioned that there was an Easter Egg in the original Guardians of the Galaxy that no one managed to find. As the release of Guardians of the Galaxy Vol 2 hits it seems that the Easter Egg has finally been found. However, this Easter Egg has implications that could spoil some of the events of Guardians of the Galaxy Vol 2. So with that said Spoiler Alert. Each location in Guardians of the Galaxy appears with a set of cordinates. These cordinates have been found to be a code and once decoded certain messages appear. Whats more these messages seem to all provide hints about the origins of Starlord. Screenrant posted this excelent infographic that goes through the codes. You can find the image and others at: http://screenrant.com/guardians-galaxy-movie-hidden-easter-egg/ credit also goes out to reddit user Mtrips who decoded Knowhere's cordinates. The decoding here is extremely simply by replacing a number with its corresponding letter in the alphabet this is not even a Hardy Boys level of encryption. Or basically saying that the cordinates for the Klyn are not real. The other locations as noted by Screen Rant seem to form a cohesive message that concerns Starlords mom and her cancer. Please note we are entering territory again that could spoil parts of Guardians of the Galaxy Vol 2 so proceed with caution. This seems to say that Merideth Quill's cancer was caused by her Ex. Her Ex is of course Star Lord's father Ego. From the film we know that Ego has procreated many times with other people and each of them he has presumabedly killed using a similar form of cancer. Meredith QuLL X - As in the station could actually be her ex aka Ego. This means that Ego was a Celestial that was struck down and his corpse floated off and became Knowhere. However just enough of Ego survived and was slowly able to reconstitute himself. Apparently, Starlord while searching for his father could have actually been walking through his father's dead corpse. This is quite possibly one of the funnest and most interesting locations in the Marvel Universe. Expect an awful lot of things to be thrown and hidden here. The home planet of the Nova Corps has been heavily features in Marvel comics. While typically associated with the Hulk universe the Sakaarans will be seen a bunch in this movie. Pretty much all of the henchmen seen are Sakaarans. In the comic books the Knowhere station that Guardians will be traveling to is run by a telepathic space dog named Cosmo. Cosmo was a dog launched in space by Russia to test to see if lifeforms could survive. Long story short Cosmo develops a heightened level of intelligence, can speak, and has some telepathic abilities. Look for mentions of Cosmo when the Guardians are in Knowhere or in the Collector's warehouse. Yondu is in the 31st century Guardians of the Galaxy however he is set to appear in the movie the Guardians of the Galaxy. His presence in the movie has not yet been explained. Michael Rooker who played Merle Dixon in the Walking Dead is set to play Yondu in the movie. Yondu is an interesting character because he is connected to a different group of Guardians of the Galaxy. Could this mean that those other characters exist in the MCU as well? This is question is answered in Guardians of the Galaxy Vol 2 where some of Yondu's former compatriots appear. Groot has spent time on Earth. I will be curious if it is mentioned at all. Is the big bad coming to rule Universe. He made a brief appearance at the end credit scene in the Avengers. Expect him to show up a lot in this movie. 8) The Collector and his collection! Multiple confirmed characters appear in the warehouse including Cosmo and Howard the Duck. I have a feeling that the Collector will be an integral part of this movie. Tivan is the collectors last name. His full name is Taneleer Tivan. As you can see below the explosion looks like it blowing up a crate marked TIVAN. There could be many things in his Warehouse. Titans, Terrigen Myst, Celestials, Eggs, Brood who knows keep your eyes open. A version of Captain America's SHIELD from the future could even show up. 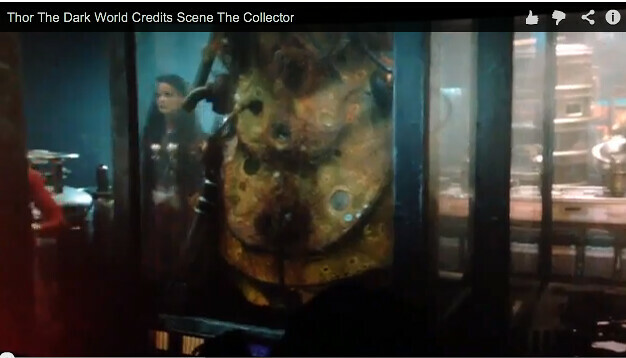 Adam Warlock's cocoon can be seen in the possession of the collector at the end of Thor 2. Could the character make an appearance in Guardians of the Galaxy? The collector is meant to appear in the movie so at the very least pay attention to the items in his possession. and Howard the Duck. This is one of the weirdest Marvel characters and also one of the first to get his own movie. There will be a Nova Corps in Guardians. Glen Close will play Nova Prime and John C Reilly will play a Nova Officer named Rhomann Dey. Rhomann Dey is the character that gives his Nova Powers to the human Richard Rider. Look for mentions of Rider in the movie. It would not surprise me if he showed up. You may be surprised who he is! Who will be Rich Rider in the Marvel Universe? Fillion? 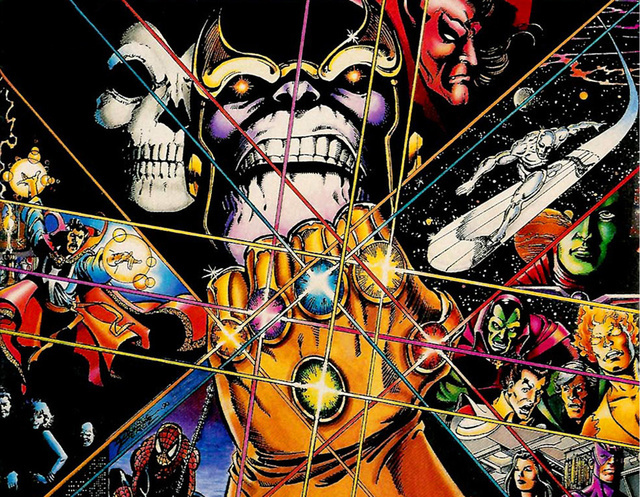 No discussion of the easter eggs of the movie will be complete without discussing the infinity gem in the movie. We know this movie is going to revolve around one of the gems. Which one we are not sure yet. Peter Quill StarLord will find one of them and be hunted by the agents of Thanos. He will learn how important it is and eventually become a bit of a hero. Part of me feels that this gem will likely be the soul gem. The soul gem may be the most famous of gems because it was used so much be the hero Adam Warlock.